In modern social media customer service, it’s important to answer every customer complaint in every channel, every time. That’s the thesis of my new book, Hug Your Haters. But almost no companies follow that advice. Instead, they answer some complaints, in some channels, some of the time. One reason businesses don‘t answer every customer is that the hate hurts too much. 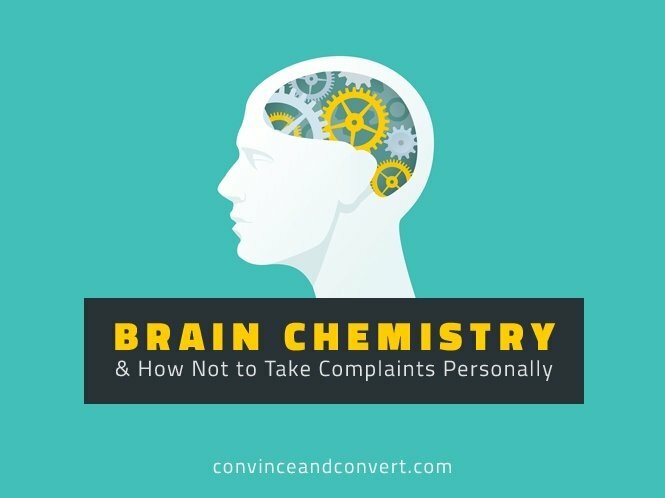 It‘s easy to take complaints personally and become bitter and cynical about the entire customer interaction process. This is especially true for small businesses. Nearly four in 10 haters in social media expect a response within an hour, yet the physiological impact of negativity on our brains and our judgment can last 26 hours. That’s a recipe for a poorly handled response. Your front-line customer service team needs to be filled with people who are equal parts level-headed and even-handed. That‘s often easier said than done, though, especially for small business owners who are forced to defend “their baby” against attacks that are easy to take personally. Businesses sometimes choose not to respond to complaints even when they don‘t feel personally attacked, but because they disagree with the customers‘ opinion and believe that replying adds credence where none is deserved. “I think small business owners, and people in general, have pride, and there can be a belief that to respond to complaints is to dignify them. That to respond to complaints is to validate them. Some small businesses don‘t want to say they were wrong. They don‘t want to say they‘re sorry, explains Dave Kerpen from Likeable Media. Unless they are fictitious or nefarious in some other way, however, every complaint is “true” from the perspective of the hater. Customers may have unrealistic expectations. There may have been extenuating circumstances. They may have been misled by their perspective or a simple misunderstanding, a scenario so common it often drives story lines of television shows like Three‘s Company and Curb Your Enthusiasm as well as the films of Akira Kurosawa and Alfred Hitchcock. In short, what the customer believes to have happened is what happened, in their head and in their world. Ignoring this and refusing to reply to complaints because you disagree with the assertions and do not want to unjustly dignify them, is a textbook case of cutting off your nose to spite your face. Remember: haters aren‘t your problem, ignoring them is.